There, I’ve used the words most often spoken by the amateur blogger or posted on Trip Adviser. If we were to be believed there would be dozens of hidden gems in every city across the UK. So why do I say it here? I have visited Nada Budaya, situated below the Brewdog pub on Broad Street, a handful of times and it has rarely been busy. It also appears little known when I speak to people about food in Nottingham, but it is one of my favourite places to return to. The restaurant itself is a neutral space with good light considering it is below ground, it can however lack a little in atmosphere especially on those evenings where not many tables are occupied. The food is ‘authentic Malaysian’ and whilst I have no point of reference the Executive Chef hails from North Malaysia would assure me that this reflects the mixed influences from China, Arabia, Thailand and India. We arrived early in the evening and took advantage of the offer of 2 courses for £12.50 before 7pm. That menu is a limited amount of options from their full a la carte menu. 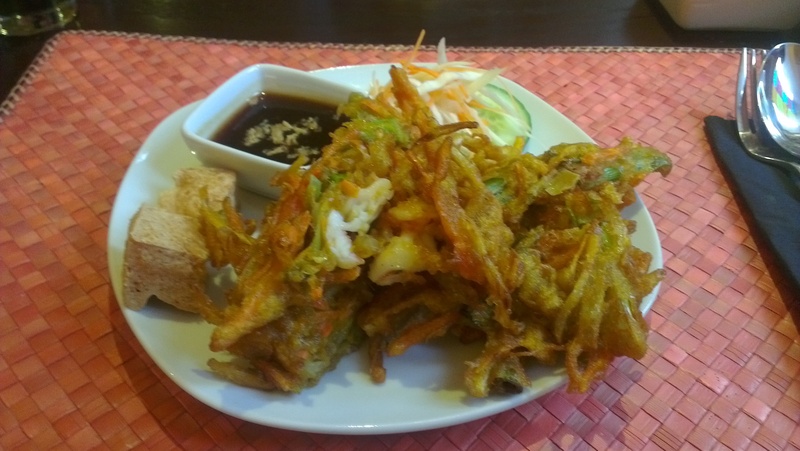 Cucur Udang a Malay onion bhajj of sorts including prawn, the onion and beansprouts cooked in a light batter. Equally good as a vegetarian option it is served with a really good dipping sauce and some nicely fried tofu. 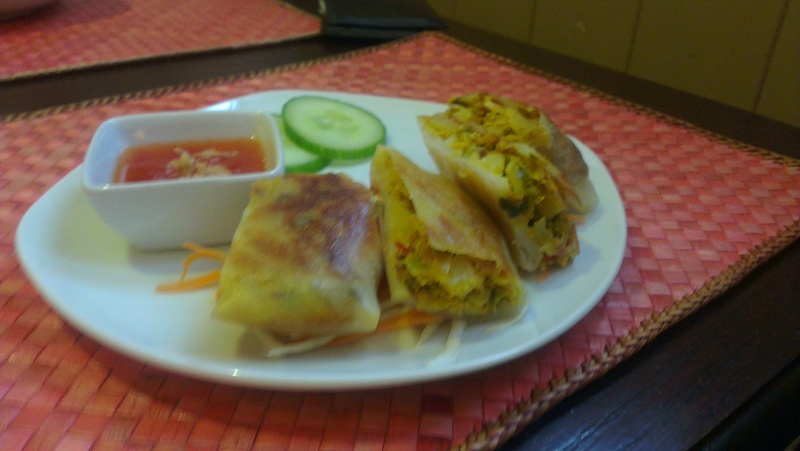 Murtabak; a crispy, stuffed pancake with chicken or beef with egg and potato again had a good sweet chilli accompaniment and was surprisingly light. 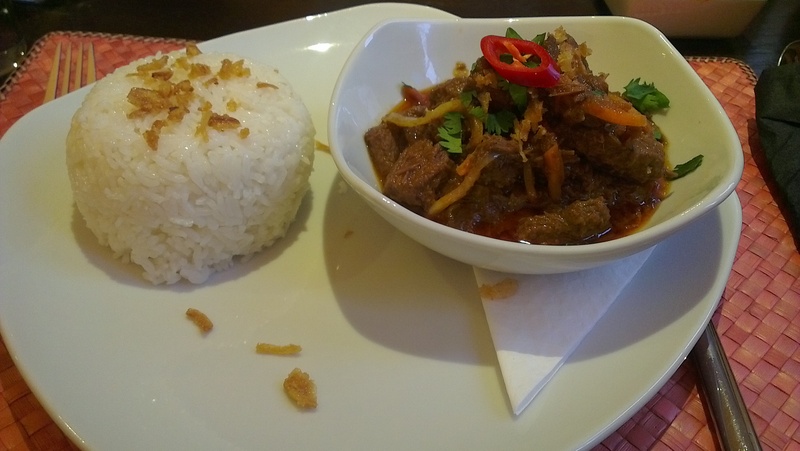 The most popular choice of main course was a personal favourite of mine, Rendang. One of the most famous Asian dishes the Rendang was voted as a favourite world dish in a poll a few years ago, such is its universal appeal. The version at Nada Budaya ticks all the boxes, beautiful slow cooked beef (or chicken) in a rich, warmly spiced sauce. A dhal vegetable curry was a little milder but well cooked and a noodle dish of Mamak Mee Goreng is packed with tasty little additions to the well cooked noodles. For one of our mains we had an off-menu dish, a non-meat eater wanted a prawn dish with a Rendang sauce. The creation was good with a little sweeter sauce than with the slow cooked meat but a lovely mix of spices nonetheless. That last dish typifies the service at Nada Budaya, friendly and cannot do enough for the customer. The price too is great when you take advantage of a number of their offers. Outside of those the average cost of a main is £10–14 with starters at £5-6. A warm welcome, great food with favourites to return for at a good price. Exactly what you want from your local hidden gem. Being a Malaysian myself, and having tried their food twice, i can tell you that Nada Budaya is a very poor example of authentic Malaysian food. for a better experience i’d recommend Penang in Westfield London. Thats fair enough that you’ve enjoyed your visits. I’d definitely recommend you try Penang in London though. much much better food.